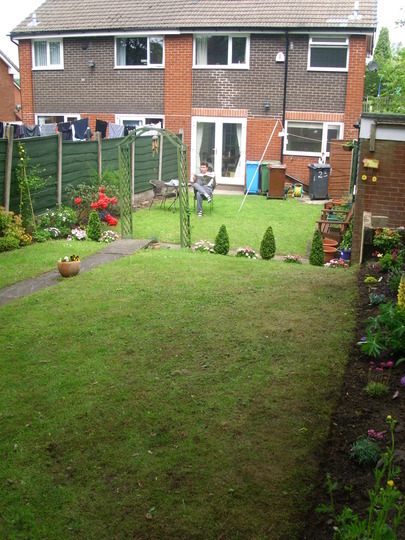 Just wanted to share with you all what we have achieved with phase 2 of our garden redesign. Last month was phase 1, which saw us erect the new arch and plant the hedges to create a ‘room’ at the top of the garden, which will eventually be our woodland area. Well phase 2 is now almost complete. See the pictures below on our progress. Sorry about the poor quality picture. 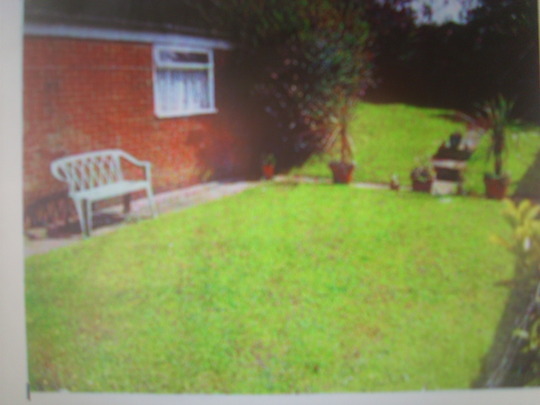 This was taken from the Estate Agents details of the house prior to us buying it in May 2007. A total blank canvass. 2008-2009. This was our first attempt at gardening (before we became really serious about it). Overall look….nice but nothing special! Summer 2010. 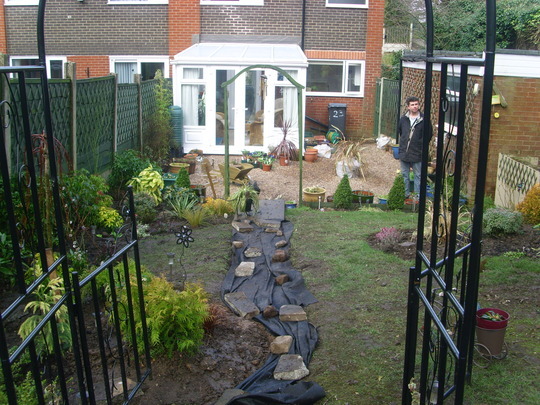 A view of the bottom of the garden before the grass was lifted to make way for the conservatory and the new courtyard. Late summer 2010. The conservatory and courtyard. February 2011. 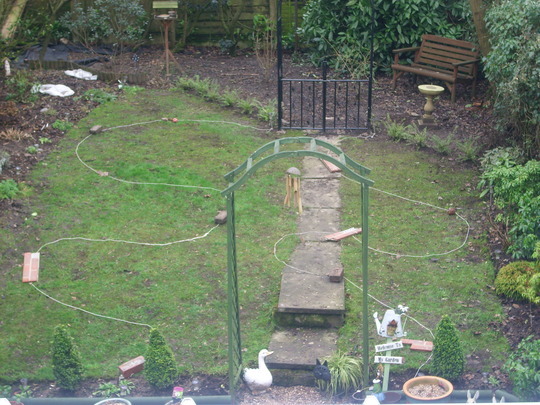 The beggining of phase 2 and making the garden more interesting. We decided to do away with ‘straight’ borders and introduce curves, leaving a curving path of grass to take you from the bottom of the garden up to the top. We also wanted the majority of plants in these new beds, to be ervergreen, to give us winter interest. This is the design marked out. Hubby and i were unable to move the following day through aching muscles! Both sides of the garden are now planted, and christmas gifts are finally put into the garden. Spot the frog and the cat on the bike! Hubby yesterday surveying his work! (and mine of course). 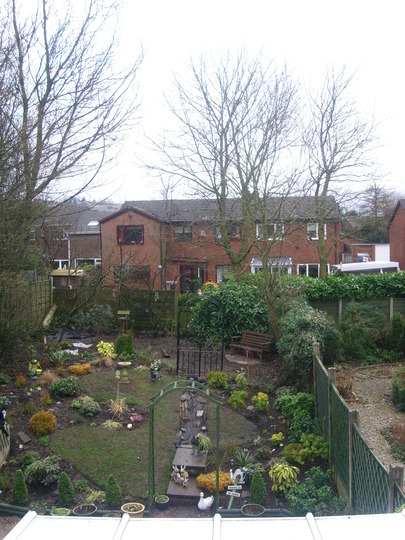 A birds eye view of our new garden! And i love it. 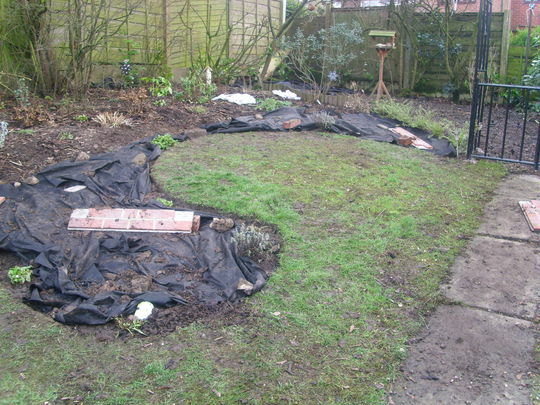 There’s still plenty to do, the grass isnt in the best of condition so needs some TLC, and the black sheeting covering the soil were we have lifted the old flagstone path, requires some new turf laying. You’ll notice we have left the 2 steps. They are home to a family of frogs who have lived here as long as we have, so we didnt want to upset them. We’ll disguise the steps with pots. There’ll also be lots of annuals gowing inbetween the shrubs during summer, cosmos, dahlias, ricinus communis to give extra height, colour and interest. Previous post: Much better than being at work! What a marvellous transformation you and your OH have made. 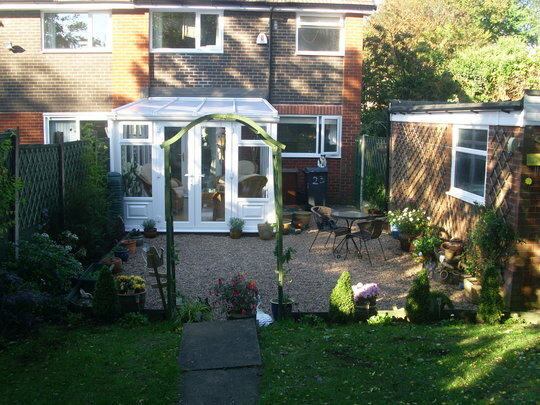 It will look superb when all your plants have settled in. It just shows what a lot of hard work can give you doesn't it ? An what a good idea it is to take photos of before and after as you can really see the difference. Keep up the good work and Happy Gardening. Much nicer! Your garden will just grow and grow in character now. Congrats. on your wonderful work ... ! Congratulations from me too. You have worked a miracle in a very short time. It will be lovely to see how it develops over time. You will be looking to take on an allotment, I think the bug has bitten you both. thanks everyone for your lovely comments. I cant wait to get all the summer colour in there. It will look so different again. Wow the garden has real flow, I bet it will look spectular this Summer but do you know what? you'll never finish it, theres always room for another plant. 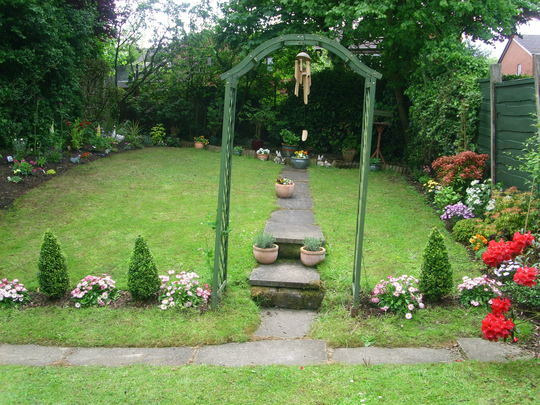 - happy gardening and keep the photos coming. 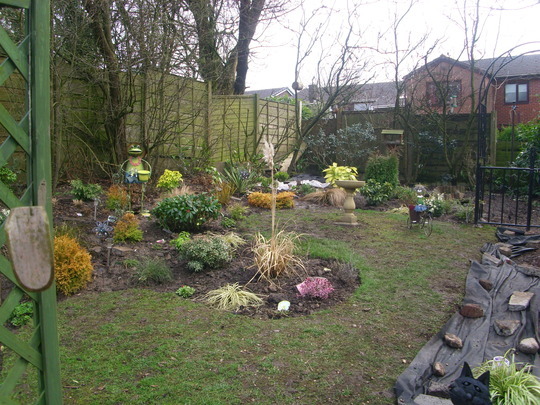 Tilly....you have both done a fantastic job in getting your garden into a very pleasing shape and it will be beautiful when everything is established and flowers appear in summer. 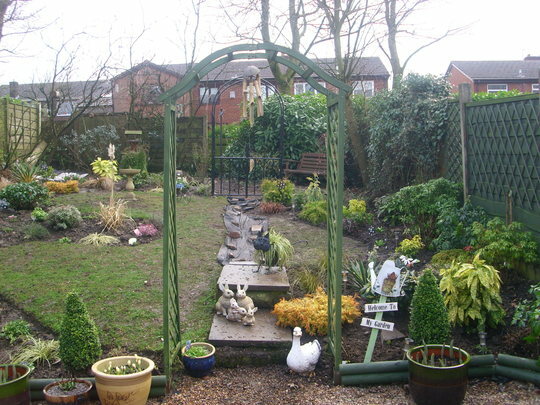 It certainly shows how much effort and love you've put into the garden since you moved in...well done! I'll be watching as the garden springs into new life over the next months. Watch those backs too with all that digging! Wonderful transformation! You and hubby have done a great job and deserve all the praise you are getting. 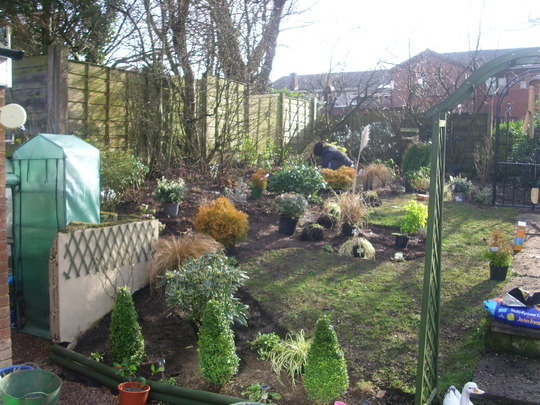 The design is a great transformation and it will all fill out wonderfully and change of course with each season as well as every time you see a plant or two when you are out that just needs to fill a space in your beds. Enjoy it all you richly deserve to! Much better than being at work!